The Sharp AL-2040CS is a complete 3-in-1 solution for a small office or home office. The multifunctional device will satisfy the business requirements with fast, quality prints. 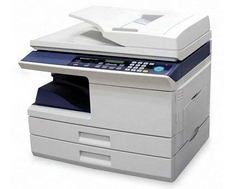 The functions of the Sharp AL-2040CS are copying, printing, and scanning. The printer is available in a price range of $500-$1000. The main features are what distinguishes the Sharp AL-2040CS from its competitors. The printer utilizes a digital laser to copy at a rate of 20 pages per minute, and print at a rate of 16 pages per minute. The picture quality is improved, compared to the printer's predecessors, and the laser is more reliable. The USB port is pretty standard, and the integrated network card permits the printer to be shared among the terminals of a network. Two-sided printing, highly popular, is available for businesses who create book-like layouts. Two-sided printing is a solution for paper conservation; therefore, reducing overhead costs to run the business. Offices can swiftly copy large documents with the 50-page ADF. The 250-page sheet tray is more than convenient for large printing/copying jobs and can supply diverse media types and sizes. The USB permits full-color scanning of up to 9600 dots per inch to display images as a detailed, accurate description; the optical resolution of the printer is 600 x 1200 dots per inch, and the color depth is 24 bit. Users can utilize the bypass tray, which can take up to 50 pages, for unique sizes and paper types. The SharpDesk 2.7 software gives a novel solution for OCR scanning management of images; users can convert their scans to files compatible with the sender's format. OCR is renowned for editing text, converting, storing, and sharing files. The printer comes with a limited warranty of one-year for replacement of parts and labor. Printing processes are network capable. Copy-rates vary to the state of the printer; it takes 8 seconds for the first copy in normal mode; it takes approximately 25 seconds for a copy from the preheat mode. To eliminate costly misdials, there are 18 rapid dial keys simplify the process and allows for storing frequently used numbers. The printer can save up to 81 speed dials for quicker transference of files. Ethernet and USB make up the network interface. The installation process is relatively undemanding, provided the computers run on Windows Vista, Windows XP, Windows 2000, Windows ME, and Windows 98. Users find clarity with the set-it and leave-it continuous copy feature. Warming up the printer takes roughly a half of a minute. Printer language is host-based, and the max resolution of prints is 600 x 600 dots per inch. The zoom range can be set in increments between 25%-400%. The scanner employs 256 levels of shades. The laser printer is 20.4 inches in width, 17.5 inches in depth, 17.5 inches, in height, and 45 pounds; this makes the printer capable of fitting atop any workstation with ease. The standard memory of 16 Mega Bytes should be appropriate for small office environments; especially with printer capability of automatic duplexing. 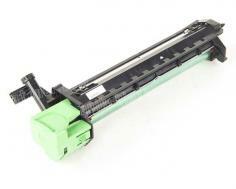 The max document size the printer can handle is 8.5 x 14 inches; the minimum size is 3.5 x 5.5 inches. 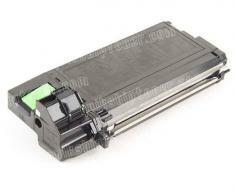 Therefore, the printer can handle ordinary paper, transparencies, and envelopes. Altogether, the volume of media the printer can take is 550 sheets. Unfortunately, Sharp should of included 2-in-1 copying features. There is no integrated digital answering system. The minimum requirements of installing the printer are limited to Windows operating systems. Dual copying, edge and center erase, X-Y zoom, negative/positive reverse and refinement of margins will not be an option on the Sharp AL-2040CS MFP. Review it: "Sharp AL-2040CS "
The AL-100DR drums are compatible with the Sharp AL-2040CS MFP. Genuine drums for the Sharp AL-2040CS will yield up to 18,000 pages. The AL-110TD toner will yield up to 4,000 copies, and the AL-100TD yields up to 6,000 copies. Of course, the page yield is dependent on the complexity of copies/prints. Typically, there are cheaper deals depending on the retailer and brand.